Is your door giving you some hard time? Don't worry, we'll set it straight; figuratively and literally. If your rollers pop out of the track, the springs look like they're about to break, or some part of your opener is causing it to malfunction, we'll be there to quickly fix things. Check out the following projects to learn more. 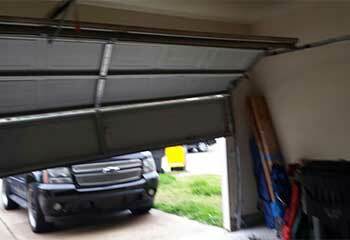 Customer Issue: Mr. Fontaine’s new home came with a garage door, but no opener. 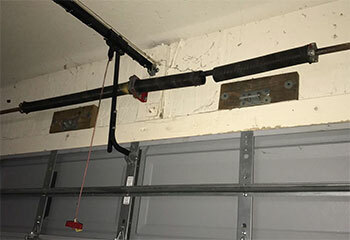 He wanted to automate the process of opening and closing his overhead door, so he contacted us for help. 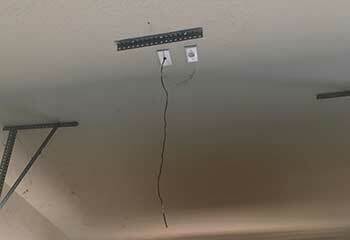 Our Solution: The ever popular LiftMaster 8500 garage door opener model appealed to the customer thanks to its compact size and lack of complicated external drive features, and his door had a compatible torsion system. Installation was easy, and the team programmed it alongside a Genie-LM remote three button remote handset. Customer Issue: Bends in the track. Our Solution: As a result of the malfunction, the door had gotten stuck slightly open, so we started by securing it in place first. We then repaired the bent track section which had caused the issue, and then realigned it with the rollers. Afterwards, we operated the mechanism a few times just to be sure all the other parts were ok. Customer Issue: Worn out springs about to break. Our Solution: A quick inspection revealed the condition of the torsion springs to be terribly close to complete failure, so we immediately released their tension and removed them from the shaft. After installing the new units, we balanced the door and opened and closed it a few times to ensure everything was working correctly. Customer Issue: Cable got caught on the door's interior lock. Our Solution: The first thing we did was disconnect the cable completely and then wind it back over the drum, making sure it fit into the right grooves properly. 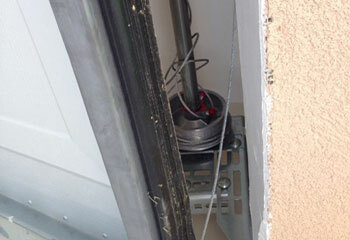 Then we removed the lock and reinstalled it somewhere it won't cause this type of malfunction again.